3/2012 EDITORIAL Dear friends of BIW, We are not just concluding our 40th anniversary year with the third issue of our customer magazine but also our first year of professional, direct communication with our customers in the form of our e-newsletter and online magazine, which are both entitled “BIW COMPACT”. 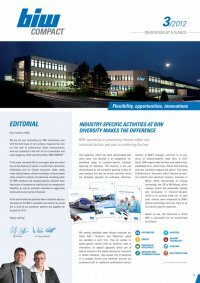 In this issue, we would like to once again draw your atten- tion to the diversity of sectors in which there technically challenging uses for silicone extrusions, tubes, ready- made sealing frames, silicone mouldings, silicone coated cable protection systems and electrical insulating tubes. All BIW’s products and customer-specific solutions have high levels of temperature stability and low-temperature flexibility, as well as excellent resistance to aggressive media and environmental influences. At the end of what has generally been a turbulent year eco- nomically but for BIW a successful one overall, we would like to wish all our customers, partners and suppliers all the best for 2013. Happy reading! 01 This expertise, which has been accumulated over many years, has resulted in an exceptional, un- paralleled range of customer-specific solutions spanning all industries. This diversity is not just demonstrated by the constantly growing number of new products but also by various activities which are designed specially for individual industries. We recently published some industry brochures en- titled “Rail”, “Aviation”, and “Medicine” which are available in print form. They all contain in- dustry-specific details such as technical data or information on special approvals which are of special interest to the experts among our customers in certain industries. They answer lots of questions in a compact format and therefore provide our customers with an additional professional service. Another of BIW’s strategic activities is its pre- sence at industry-specific trade fairs. In 2012 alone, BIW experts have had their own stand at four established fairs, where they offered both existing and new customers support and advice. They were CoilTechnica in Hannover, which focuses on elec- tric mobility and electrical isolation, Innotrans in Berlin, which concentrates on railway technology, the IZB in Wolfsburg, which revolves around the automobile industry and Aeroliance in Clermont-Ferrand, which is an aviation trade fair. In each case, visitors were impressed by BIW’s general knowledge and even more so by its industry-specific expertise. Based on use, the industries in which BIW is successful can be summarised as follows: — Dr. Markus Wiethoff Ralf Stoffels Dr. Markus Wiethoff Automotive Energy Household appliances Medicine and pharmaceuticals Aviation Railway technology sanitary Heat protection When it comes to competence When it comes to competence Flexibilität, Chancen, Innovationen Branchen und anwendungen LuFtFahrt Gewicht sparende und nicht brennbare Systemkomponenten aus Silicon und Silicon-Schaum When it comes to competence When it comes to competence Flexibilität, Chancen, Innovationen BRANCHEN UND ANWENDUNGEN MEDIZIN- UND PHARMATECHNIKFlüssig- und Festsilicone für den Einsatz im Bereich der Medizin- und Pharmatechnik When it comes to competence When it comes to competence Flexibilität, Chancen, Innovationen Branchen und anwendu ngen BahnteChnIk Feuerfeste Funktionselemente, hochwertige Dichtungssysteme sowie Kantenschutzprofile aus Silicon und Silicon-Schaum INNOVATION AT A GLANCE Flexibility, opportunities, innovations Compact When it comes to competence When it comes to competence INDUSTRY-SPECIFIC ACTIVITIES AT BIW DIVERSITY MAKES THE DIFFERENCE BIW specialises in processing silicone rubber and technical textiles and also in combining the two.